Abbeville City Hall is located at 101 East Washington Street, Abbeville, AL 36310; phone: 334-585-6444. Photo: Bethune-Kennedy House, ca. 1840, 300 Kirkland Street, Abbeville, AL. Listed on the National Register of Historic Places in 1978. Photographed by User:SaveRivers (own work), 2012, [cc-by-3.0 (creativecommons.org/licenses/by/3.0)], via Wikimedia Commons, accessed January, 2016. Abbeville is the County Seat of Henry County. Henry County was created on December 13, 1819, just one day before Alabama was admitted as a State. At the time, Henry County comprised most of the territory of Southeast Alabama, which was traversed by Creek and Seminole Indians. 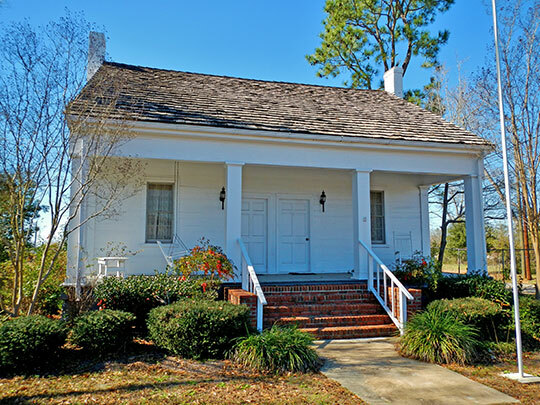 Abbeville was settled at approximately the same time period on a ridge top just west of Abbie Creek by primarily settlers from South Carolina and the County Seat was placed at Abbeville in 1833. Abbeville was incorporated in 1853. Abbeville grew as an agricultural trade and governmental center of Southeast Alabama through the rest of the 1800s and early 1900s. Then, Abbeville began to have more of a manufacturing presence by the mid-1900s. Southeast Alabama Regional Planning and Development Commission and City of Abbeville Planning Commission, Comprehensive Plan 2035, adopted 2014, www.cityofabbeville.org, accessed January, 2016.